Acknowledged author Orin Kerr wrote Computer Crime Law (American Casebook Series) comprising 920 pages back in 2018. Textbook and etextbook are published under ISBN 1634598997 and 9781634598996. Since then Computer Crime Law (American Casebook Series) textbook received total rating of 3.5 stars and was available to sell back to BooksRun online for the top buyback price of $87.90 or rent at the marketplace. 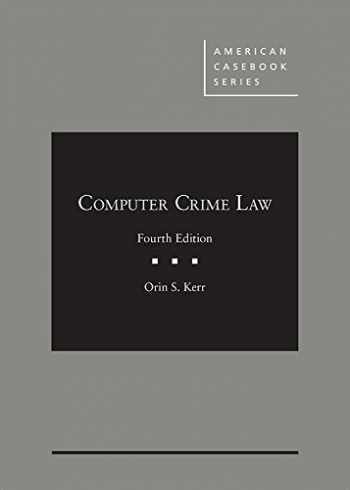 The fourth edition of Kerr’s popular computer crime law text includes many updates since the third edition in 2012. New cases and materials address topics such as encryption, the computer hacking laws, Internet surveillance, the Cybersecurity Act of 2015, hacking back, drafting computer warrants, the All Writs Act, the law of accessing foreign-stored e-mail, and the international application of the Fourth Amendment. The chapter on the Fourth Amendment has been substantially rewritten and reorganized to reflect the increasing integration of the Internet to computer search and seizure law.The book covers every aspect of crime in the digital age, and it is presented in an engaging and accessible style. Topics range from computer fraud laws and international computer crimes to Internet surveillance laws and the Fourth Amendment. It is part traditional casebook, part treatise. It both straightforwardly explains the law and presents many exciting and new questions of law that courts are only now beginning to consider. The book is ideally suited either for a 3-credit course or a 2-credit seminar. It will appeal both to criminal law professors and those interested in cyberlaw or law and technology. No advanced knowledge of computers and the Internet is required or assumed.Computer crime law has become an increasingly important area of criminal practice, and this book provides the ideal introduction to the field. Many U.S. Attorney's Offices have dedicated computer crime units, as have many state Attorney General offices. Any student with a background in this emerging area of law will have a leg up on the competition. Students will also find the book easy and fun to read, while professors will appreciate the accessible introduction to an important new field with many open questions for legal scholars.The materials are authored by Orin Kerr, the John J. and Frances R. Duggan Distinguished Professor at the University of Southern California Gould School of Law, who is widely recognized as the leading academic authority on the law of computer crime.